As part of the research for my latest series, I have had the pleasure of spending some time on the Iberian peninsula in the 13th century. And once there, I seem to have got stuck, intrigued by the constant conflicts between Christians and Moors, Castilians and Aragonese. 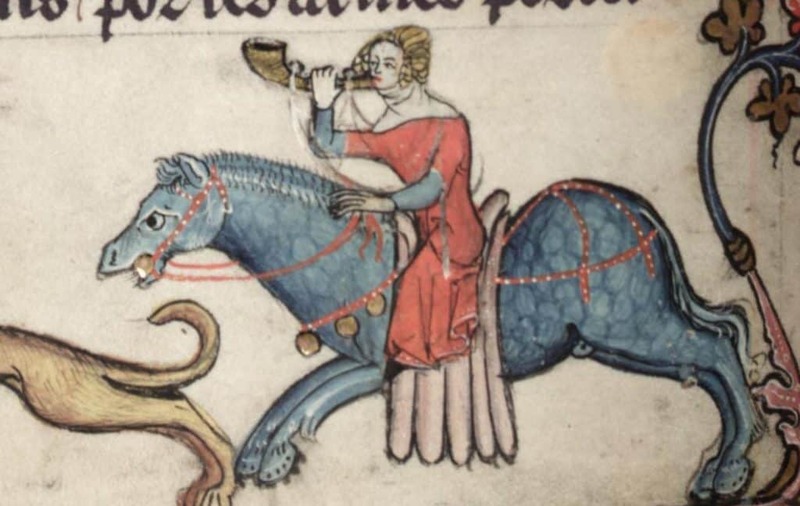 Strong women, powerful warrior kings – Eleanor of Castile, Edward I’s queen, came from a line of brave men and women who had repeatedly set their lives at risk to expand their kingdoms and powerbase. Okay, so that sort of behaviour is not always condoned, nor should it be. But things were more fluid back then, with land changing hands as first one, then the other party gained the upper hand. I posted recently about Jaime I of Aragon and his complicated love-life. Today, I want us to spend some time with one of his daughters. You may recall that Jaime was first married to yet another Eleanor of Castile. But it was with his second wife, Violant of Hungary, that he really settled down to do the baby thing –well, to be fair, it was her doing the baby thing. The male contribution to the effort is about a teaspoon, the rest is all down to the woman. Violant gave Jaime many sons and daughters. 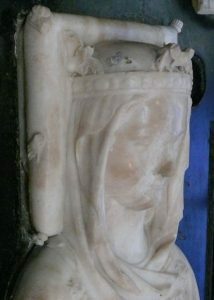 One daughter, also named Violant, was destined to become queen of Castile. The royal houses of Castile and Aragon inter-married frequently in their aspirations to create some sort of lasting peace. Not that it worked: the moment they saw an opportunity for discord, they took it. Jaime’s fourth daughter was named Isabel. Jaime was famous for his good looks. Hair in various shades of chestnut, fair skin, tall and lithe – he may have had somewhat dysfunctional parents, but the genes were good. He passed these down the line, so I guess Isabel was probably one of those willowy young ladies who could dress in rags and still look graceful and cool. Good qualities in a queen, as was an all-round education. The Iberian royals believed in education—for both boys and girls. At the time, Aragon was not a Spanish kingdom. It was a sprawling realm, extending well into Provence. The courtiers at Jaime’s court spoke Occitan, Aragonese (an early version of Catalan), Castilian and likely some Latin as well. They belonged in a cultured world, a world of chansons and troubadours, of learned men and recurring war. With such extensive lands, Jaime was constantly busy defending some part—unless he was adding to his kingdom, like when he invaded the Balearic Islands and “freed” them from the oppressive Moorish rule. Not so sure the liberated people had felt all that oppressed, but it would be a big fool who voiced that sentiment in the hearing of Jaime El Conquistador. With Jaime being such a powerful force, many were the kings who wanted to enter into alliances with him. 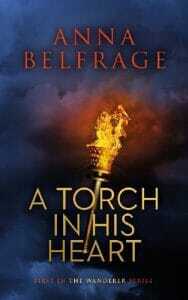 One way of doing so was by suggesting a match between their precious son/daughter and one of Jaime’s handsome brood. This is what the French King, St Louis, did, proposing that his second son, Philippe, be wed to Isabel. Jaime was pleased. St Louis was still not canonised, but he cast a long shadow over his contemporaries who admired this pious warrior king. What Isabel thought, we do not know. Likely, she trusted her father to arrange a good match for her. Turns out it was to become a much better match than originally intended. In 1260, Philippe’s older brother died. By the time Isabel and Philippe wed, he was the confirmed heir to the French throne, with Isabel firmly en route to the coronet and ermine of a crowned queen. Philip was not your hero type. While he has gone down in history as Philip the Bold, this is because he was a brave warrior rather than an imposing personality. In fact, he seems to have been quite the mama’s boy—not in itself a reflection, as Philippe’s Maman, Marguerite de Provence, was quite the forceful lady. Anyway, dear Maman had Philippe swear a holy oath that he would remain under her tutelage until he became thirty. This did not please cher Papa, who took the trouble of appealing to the pope to free Philippe from his oath to his mother. I’m thinking the Louis – Marguerite union was not exactly a bed of roses, but then when two forceful characters get together sparks tend to fly. Whatever the case, Philippe’s parents were a hard act to follow and their second son was a pious, reserved person who was anxious to please his father and his mother. I hope he was as eager to please his young bride. 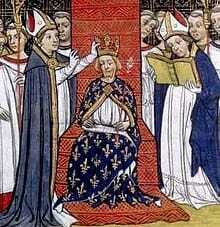 At the time of their wedding in 1262, Philippe was about seventeen, Isabel three years younger. She gave birth to a live son around 1264, to be followed by yet another son in 1268. A third son, Robert, was born the year after while baby Charles saw the light of the day in 1270. Isabel had more than done her duty, presenting her husband with four sons in eight years. Louis made for Tunis. A rather roundabout way to get to the Holy Land, but Louis believed he could undermine the Muslim supply chain by conquering Tunis. Or maybe he decided to kill two flies with one stone and help brother Charles solidify his hold on Sicily by weakening Tunis. No matter his reasons, going to Tunis turned out to be a bad, bad choice. 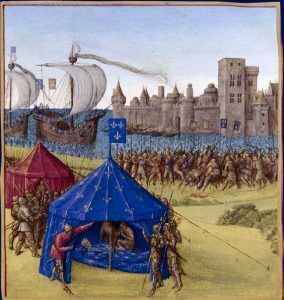 The besieging army led by Louis was struck down by disease. 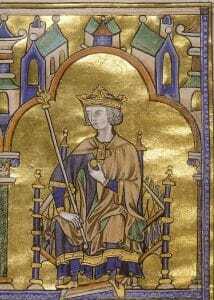 Louis had ridden off to war accompanied by several of his sons, including Philippe, at the time the Count of Orleans. With Philippe went his wife, maybe because she hoped to have something of a family reunion – Jaime of Aragon had also pledged himself and his men to this latest Christian venture. In the event, Jaime’s fleet was badly damaged by a storm and the king of Aragon returned home with most of his men. Only a ship or two made it across the seas to offer their support to the French. Philippe was proclaimed king there and then. Leaving the mopping up of this disastrous campaign to is uncle, Philippe immediately set off for home, accompanied not only by his father’s (and, one assumes, his brother’s) bodies but also by his wife, who was pregnant with their fifth child. It must have been a rather depressed cavalcade: of the proud French army that set out, little was left, and even worse, their strong and righteous king was dead. Philippe was but a pale shadow of the man his father was, and I imagine he did a lot of swallowing and wiping his brow surreptitiously as he considered just how impossible it would be to fill the shoes of his paragon of a father. One moment, everything was trundling along. The next, Isabel’s horse shied and threw her. Poor Isabel landed so badly she broke her spine. The incident also forced her into premature labour and the poor woman with her damaged back suffered terrible agony as her stillborn baby was ejected by her body. There was no hope of recovery, and to her injuries were added a post-partum infection. After a further seventeen days in agony, poor Isabel died. She was not yet twenty-three. Her husband must have felt as if God had turned his face away from him: in a matter of months, he’d lost a brother, a father, a brother-in-law, a wife and a stillborn son. Before him lay months of travelling, accompanied by his deceased relatives. Not until May did he arrive in Paris, where the first order of the day was to organise the interment of the dead. While Isabel lay still and silent in her grave in St Denis, for Philippe life went on. He was young, king of a mighty country and a widower with four sons (soon to become three, as his third son died in 1271). Obviously, he needed a new wife. Enter Marie of Brabant, who seems to have been quite the forceful character—and very determined to do what she could to safeguard her children’s interests over those of Isabel’s sons. Or so some of the chronicles tells us, blaming Marie for the poisoning that killed Philippe’s eldest son. But that, I think, is not a story to explore further here. Isabel of Aragon’s second son, Philippe, was to grow up to become Philippe le Bel. This medieval French king seems to have inherited little of his grandfather’s saintly disposition. After all, it is Philippe who engineered the destruction of the Templars—and who, according to some, was cursed for so doing, which resulted in one of the biggest scandals of the time. A juicy scandal, complete with adulterous princesses, embroidered pouches, vile death and a somewhat prim tattle-tale. You can read more about all that here! This poor family. They endured so much loss in such a short period of time. I hope you will write about Marie of Brabant sometime.